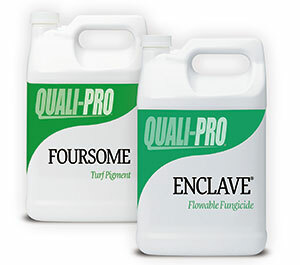 Purchase 2 cases of Enclave Flowable Fungicide, and 1 case of Foursome Turf Pigment and get 1 case of Enclave FREE! See website for complete details. Newly patented Enclave fungicide features Quad-Control Technology™ to control major turf diseases. Enclave offers landscape professionals, turf managers and horticulturists a superior level of disease control through multiple modes of action. Enclave’s synergistic formulation prevents and controls disease through multi-site activity that prevents diseases both at the point of contact and systemically in the plant. Results from university studies conclusively found that Enclave applied with Foursome outperforms other fungicides and consistently improves disease control. Enclave has been formulated to eliminate disease pathogens ranging from anthracnose to brown patch to snow mold on turf year round. Now is a great opportunity to give Enclave and Foursome a try.